For the day hiker looking for a little more coverage, this sock adds a small amount of cushion. An open, mesh fabric and two types of rib offer enhanced breathability and a perfect fit. Inspired by today&apos;s ultra-light hiking shoes. SmartWool&apos;s fibers offer the most efficient moisture-moving system on the market. Transports water while it&apos;s still in the vapor stage, before it condenses(keeps you drier longer). Versatile Works with your body&apos;s heating and cooling system, keeping you cool in the summer and warm in the winter. Suitable for a wide range of conditions. Dryness means an enviroment that is inhospitable to odor-causing bacteria. More wearing, less washing. How do we make SmartWool smarter? 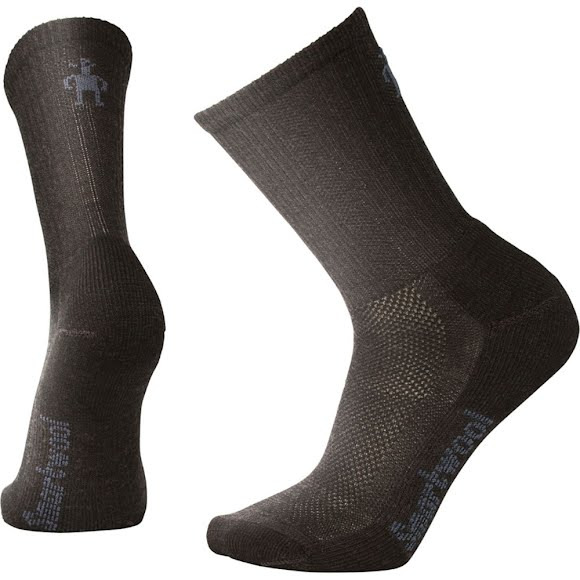 Try adding more SmartWool! WOW technology adds an additional layer of 100% SmartWool Duroyarn in the High Impact Zones to give the new PhD sock line up to 30% more durability. More wool is better in a bunch of ways. It increases durability, performance and comfort. And since WOW reduces nylon content, your long-lasting socks move moisture better and control temperature and odor more effectively as well. Last but not least, more wool means a more sustainable sock. Because wool is a renewable resource after all, and nylon isn&apos;t.